March 9, 2019 – NASA has extended the Cyclone Global Navigation Satellite System (CYGNSS) mission for an additional year and a half. 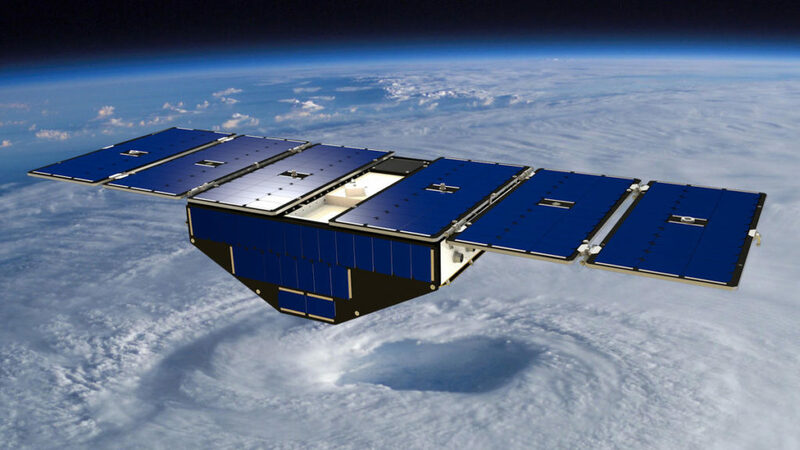 The constellation of microsatellites designed and built at Southwest Research Institute has made history over the last two years, penetrating thick clouds and heavy rains to accurately assess wind speeds and better understand hurricane intensification. Assessments confirmed that all eight spacecraft and their subsystems are healthy and ready to support two more years of operations. The microsatellites — each roughly the size of carry-on luggage — make frequent measurements of ocean surface winds to monitor the location, intensity, size and development of tropical cyclones. Flying in formation, the spacecraft cover an orbital swath that passes over most of the Earth’s hurricane-producing zone, up to 35 degrees north and south of the Equator. This science is critical because, over the last few decades, forecasters have improved hurricane path prediction significantly, but the ability to predict the intensity of storms has lagged behind. Collecting data in the midst of a storm is difficult and dangerous, but conventional space technology could not provide accurate measurements. GPS signals penetrate intense rainstorms, and CYGNSS uses these signals, reflected off the ocean surface, to calculate wind speeds. During the prime mission phase, CYGNSS science has led to 72 refereed journal publications and 158 conference proceedings publications in atmospheric, ocean and terrestrial science as well as space systems engineering. SwRI led the engineering development and manages the operation of the constellation. The University of Michigan Climate and Space Sciences and Engineering Department leads the science investigation, and the Earth Science Division of NASA’s Science Mission Directorate oversees the mission. SwRI’s office in Boulder, Colorado, hosts the mission operations center, which commands the spacecraft, collects the telemetry and transmits the data to the science operations center at the University of Michigan.